Swiss skiers pulled off an upset victory today at the 2018 Olympic Women’s Ski Slopestyle event at Phoenix Snow Park, South Korea. Sarah Höfflin landed a perfect switch double cork 900 on her final run to edge out her teammate Mathilde Gremaud—who landed her own double in her first run—for the gold. 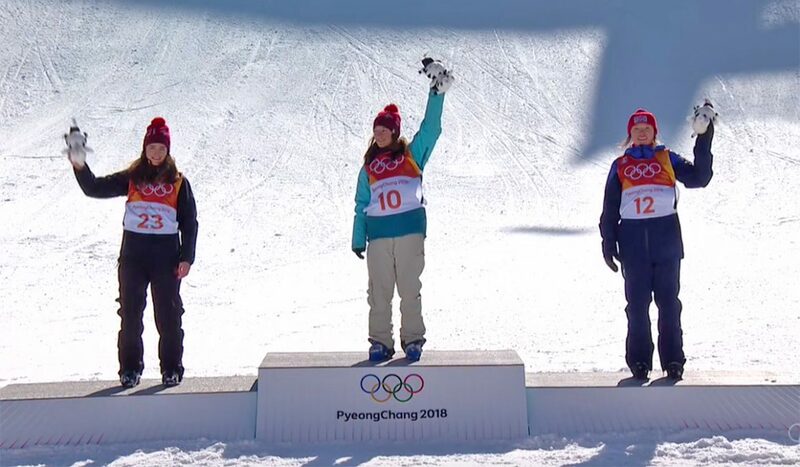 It’s a totally unexpected gold-and-silver party for the Swiss, with Great Britain’s Isabel Atkin edging out American Maggie Voisin for the bronze, to complete a women’s slopestyle podium that no one saw coming. After a qualifying round that saw a large variety of landed runs, many of the competitors succumbed to pressure in the finals. Of the top qualifiers Emma Dahlström, Johanne Killi and Tiril S. Christiansen, only Killi managed to put down a clean finals run, good enough for fifth place. Höfflin's switch double 900 seals the deal. Mathilde Gremaud held the lead for much of the contest after stomping her own massive switch double, a 1080, for a score of 88. Gremaud stomps her big switch double 1080. Meanwhile, Park City local Isabel Atkin—skiing for Great Britain—knocked American heavyweight Maggie Voisin out of the bronze-medal spot with a hammer run of her own.